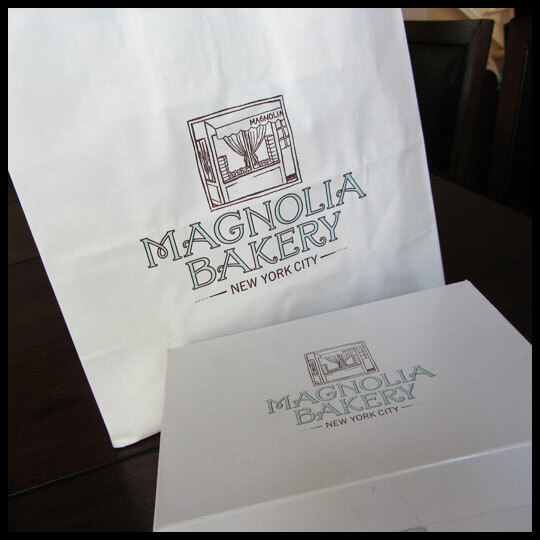 As I mentioned last week in our Christmas post, Elisa and I stopped by Magnolia Bakery‘s Rockefeller Center location this past month since we were in the area. Even though it isn’t our favorite cupcake place in the city, we were both hoping to try their Chocolate Truffle Cupcake, but they were out that night. So instead, we got the Rockette Red Velvet, a classic Vanilla with Chocolate frosting, and a Pistachio cupcake. Unfortunately none of them were very good. 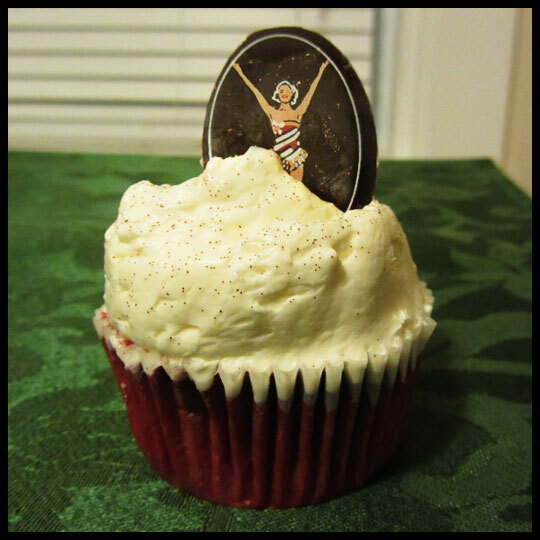 Since we already posted about the Rockette Red Velvet in our Christmas post, we wanted to share our thoughts on the other two. Like the Red Velvet, the cake was very dense and dry. The redeeming quality to this cupcake was the flavor. It really did have great pistachio flavor. I wouldn’t go all the way back to NYC for this cupcake, but it ended up being the best of the three. 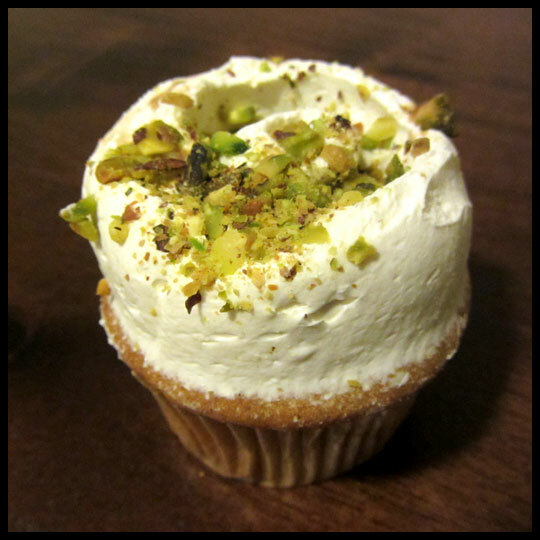 The cake on this cupcake was the same as the Pistachio and Red Velvet. Dense and dry. I’m not sure if everyone experiences this with their cupcakes, but at the rate they were baking them that night, freshness shouldn’t have been an issue. The “cupcake care” instructions on their website state that if you plan to store them (which we did for just one night) they should be kept in an airtight container at room temperature (which we always do). This didn’t change the fact that the cake was still dry. 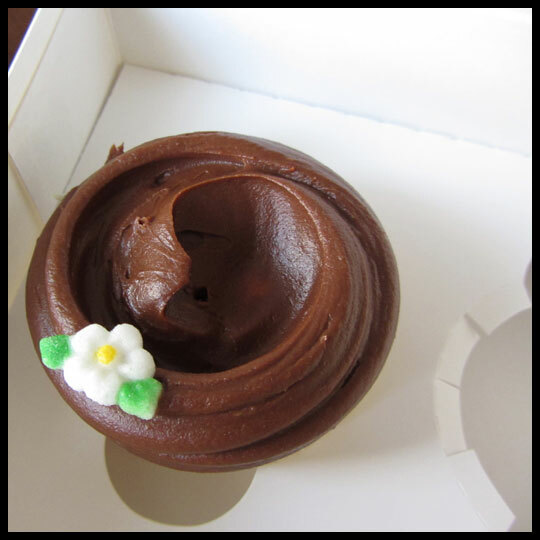 The creamy frosting could have saved this cupcake, but it was more of a milk chocolate, which I’m not really a fan of. Despite the let down with their cupcakes (which they are known for) Magnolia does have some great aspects that I love. First, the look of their cupcakes. I mean, seriously? How cute are they? They are almost too pretty to eat. Being a graphic designer, I pay a lot of attention to details like that and they do not cut corners when it comes to this. Even though I only got one cupcake (and a pumpkin whoopie pie – more on that later) they still placed my cupcake in a pretty box and a gave me a pretty bag to take with me. This gives them MAJOR points. Not only does their packaging look good, but their cupcake boxes are top notch. See those little “cupcake grips” to the bottom right of the photo above? This cupcake isn’t going anywhere anytime soon. Since they are located in NYC, it is really important to have secure cupcake packaging when you are hopping on and off of buses and subways and making your way through the crowds. Magnolia’s boxes do not disappoint. I was also very impressed with our service that evening. Since it is the holiday season, it was packed, but the employees were all really nice and kept the line moving along. It’s easy to get frustrated when you are behind the counter dealing with a crowd like that, but they didn’t let that effect them. Last, – this alone would make me go back – their pumpkin whoopie pie was AMAZING. Like, heart stopping “OMG” amazing. I wish I had taken a photo of it, but that little treat didn’t even make it back to the car. I was only going to take one bite, but before I knew it, I was finished. Unlike the cupcakes, the cake portion was super moist and rich with pumpkin flavor and spices. The cream cheese filling was an appropriate sweetness and had a nice smooth fluffy texture. This whoopie pie was worth the wait in line. 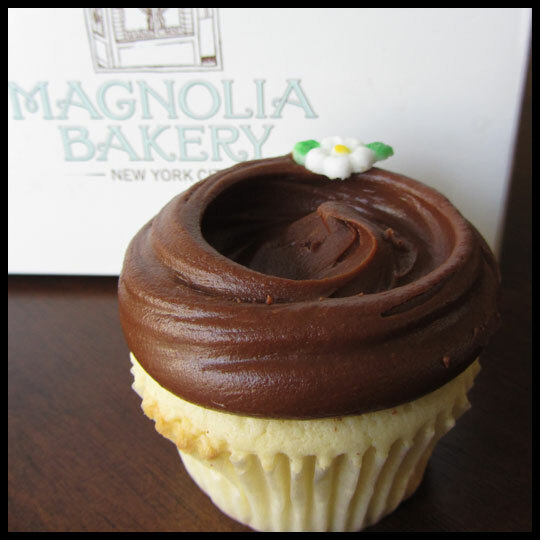 What are your thoughts on Magnolia Bakery compared to other cupcake shops? Let us know, we would love to hear! This entry was posted in Cupcakes, New York, NYC and tagged Chocolate, magnolia, pistachio, vanilla by Stacy. Bookmark the permalink. Thanks for the posts ladies! If I can’t eat them at least I can see and read about them! Thanks for reading Janet! I’m so glad to hear you had a good experience there! We’ll have to make it a point to stop in again (as long as there is no line and we are in the area). My friend went to Molly’s and wrote a review for us: https://cupcakecrusaders.com/2011/10/03/mollys-cupcakes/ I definitely want to check them out myself. Some of my favorites in NYC are Baked by Melissa and Crumbs. Did you have a chance to go to either? There are SO MANY cupcake places in NYC, I could spend a lifetime trying to get to them all. 🙂 I was in Ontario this past fall and went to 3 places: https://cupcakecrusaders.com/category/ontario/ Have you tried any of those? What are your thoughts? I’m looking forward to visiting that area again and would welcome any recommendations! Ha. I didn’t notice you had a “search” feature until I’d posted my comment … but i did find the Molly’s review and would totally agree! Didn’t get to Baked by Melissa or Crumbs (true, so MANY choices there), but did get to Baked (in Brooklyn) http://bakednyc.com/ and Everything Frosted (in chinatown)http://www.everythingfrosted.com/index.html. Baked was the better one. The cupcakes were not as good as Molly’s but much better than EF and their other baked goods (like we needed anything else) were outstanding. I didn’t like the icing at all at EF, it was the whipped-nothing-to-it type. Some people like that I guess. Of those you visited in Southern Ontario, I am a regular visitor to Prairie Girl (very close to my work). I love love love their chocolate/chocolate too. PB frosting may be my second fave, (for some reason I don’t find it too sweet) but the cream cheese frosting is great too!!! I have definitely had a few “off” ones there, though infrequent. Very consistent and delish! I haven’t been to your other two stops, but next time I am down that way, will check out! Also, my friends and I are visiting DC in April so hope to hit up some of your local cupcakeries!!! Oh.. and here’s a link to a recent local “review” of the newer shops in the Toronto area, most are downtown-ish…check back here before you come back. They review at least once a year the various options here! @Janet: Thanks for all the info! While you are in DC definitely check out Hello Cupcake. I’ve only been there once, but they had a great variety and were so friendly (I had the lemon and a peanut butter chocolate that were amazing). Of course you’ll have to go to Georgetown Cupcake (AKA: DC Cupcakes from TLC) too. 🙂 Since you didn’t make it to Crumbs in NYC, they have 3 or 4 DC locations and there is a Sprinkles not far from Georgetown Cupcakes. If you visit any other cupcake places while you are there, definitely let us know. And thank you for your link to places in Toronto! It is very much appreciated! Great suggestions! Of course “DC Cupcakes” would have been a must do… will put the others on the list and work into our schedule!! No problem… email me when you are next coming to the Toronto area and I will send you my most recent findings!! Just had a couple of cupcakes from the Bobette & Belle bakery yesterday (since at the top of the Spotlight Toronto list) and they were delish. A little less heavy than prairie girl, different but very good. That would be fantastic! Thanks Janet! Bobette & Belle was recommended to me by someone else too, so I think I’ll definitely have to check them out. I’m hoping to return to the Toronto area end of the summer/early fall. My husband and I stayed at Cottage by the Lake in Beamsville and had such a wonderful time. Between the food, the cupcakes, the views, and the people we couldn’t have asked for a better trip!